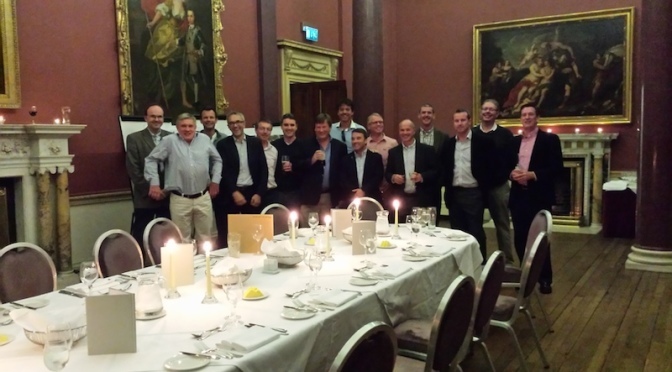 The Glenstal Class of 84 held its 30-year reunion on 20th September, and by any standard was a terrific success. 16 of the class made their way to the fitting surrounds of Carton House, which was superbly organised by Brian Doyle, ably assisted by his lieutenants Patrick O’Reilly and Gavin McGrath. While there was the inevitable handful of apologies from some who couldn’t make it, special mention is due to three of our class foreign legion who made sure they would not miss out. Oil baron Alex Lacy and Pieter Franken travelled from Holland, while John Blayney flew all the way from Istanbul, taking a break from his EU negotiations with the Turkish government. So in school report parlance, the message to our domiciled classmates who couldn’t make it is: ‘Please try harder next time’! 10 of the lads started early and got in a round of golf in the afternoon, which was excellently organised by Carl Fagan. Carl surprised many of his former classmates with his new-found obsession with golf, but nobody was surprised to see he has lost none of his competitive spirit. Played in glorious sunshine, the greenkeepers on the O’Meara course had the greens and fairways in perfect nick in anticipation of our arrival, and with no serious golfers breathing down our necks, it was played at a leisurely pace affording plenty time for catch-up chat and banter. In terms of the quality of golf on offer, well let’s just say that if Greg Ashe organises an inter-class outing, the class of 84 will hardly pose much threat. The scoring was so high that it took the numerically adept Alex Lacy nearly two days to tot up the scores and work out the winners. There is a scorecard floating somewhere in cyberspace, the highlight of which is the commentary, where Alex proved he has lost none of his acerbic wit over the years. In true tradition to the class of 84, he spared nobody from ridicule, not even himself. For the record, the winners were, surprise, surprise, Carl Fagan’s team! While one of his team-mates, Ironman Geoff de Courcy pipped Carl to first place in the individual category, courtesy of a dubiously high handicap. Reports are unconfirmed that Dr. Fagan faces a disciplinary hearing from the GUI over his arbitrary awarding of handicaps the night before the event. Unfortunately the winners will have to wait till the next reunion, when I am sure the rest of us will rise to a whip-around and bestow on them their richly deserved prizes. After the golf, it was time to meet up with the rest for a few aperitifs in the evening sun, before retiring to the resplendent Morrison Room, a most fitting location for such luminaries and leading lights of society such as we are. We were wined and dined in style, there were miscellaneous speeches of varying lengths, including some formal apologies read out and toasts made to our absent classmates, especially Boston-based Roger Moore who had championed this event from afar. As a backdrop, David Leahy arranged a most nostalgic display mount of pictures from life in Murroe in the early 80’s. To the younger GOB’s out there, it may shock you but in our day there was actually no such thing as digipics. So despite their professional reproduction, the dubious quality of some of the old Kodak images meant that some of us barely recognised ourselves. Needless to say the event drifted well into the small hours for many, although we remained impeccably behaved of course. Indeed at the time of writing, it is to our eternal credit that no bill for damages has been received from either the hotel or golf course. We were able to reminisce on times past in Murroe, the usual capers in the old Castle, dorm raids, midnight feasts and various other incursions and misdemeanours not safe to mention here, not even 30 years later!! But above all else, everyone present thoroughly enjoyed each other’s company, being able to catch up on our more recent pasts, and it was great to note that all reported themselves and their families for the large part alive and well.